Talee Thai uses their own specialised couriers to deliver their food. and served with sweet chilli sauce. onion, deep-fried and served with sweet chilli sauce. Chicken mince, peanut, carrot, corn, and peas, wrapped in a pasty, deep fried and served with sweet chilli sauce. Minced chicken, rice, stir fried with Thai spices and herbs, wrapped in a pastry, deep fried and served with sweet chilli sauce. Minced chicken, vermicelli, carrot, pea, and corn, stir fried and rolled with pastry. Deep fried chicken dumpling served with sweet chill sauce. Minced chicken, carrot, pea, corn, shallot, and spices, wrapped in a pastry, steamed and served with special soya sauce. Deep fired salt and pepper chicken wings served with sweet chilli sauce. Chicken tenderloin marinated with Thai spices and herbs, grilled and served with premium tasty peanut sauce. With your choice of: Vegetables, tofu, chicken, beef, pork, prawn or seafood. Traditional Thai red chilli paste curried with coconut milk, meat, and vegetables. Traditional Thai green chilli paste curried with coconut milk, meat, and vegetables. vegetables, potatoes, and cinnamon topped with peanuts. Panang curry paste and red chilli paste cooked with coconut milk, meat, vegetables, and lime leaves. Thai yellow curry paste cooked with coconut milk, meat, vegetables, potatoes, onion, and basil leaves. A herby and Spicy clear soup made with spicy curry paste cooked with meat vegetables, extra flavoured with green pepper corn, lesser galangal, and fresh chilli. Special BBQ chicken made with chicken tenderloin marinated with special sauce, garlic, coriander, grilled and served with sweet chilli sauce and salad. Chicken (beef or pork) fillets marinated with chef’s special sauce, flour, spices and herbs, deep fried and served with sweet chilli sauce. Thai style omelette made with eggs, chicken mince, spring onion, capsicum, and tomato, deep fried and served with sweet chilli sauce. Battered fresh chicken served with sweet chilli sauce. Fresh salad topped with meat and special chef dressing. Thai style spicy salad made with chicken mince , mint , red onion, herbs, chilli flake, ground roasted rice and seasoned with lime juice and fish sauce. Grilled king prawns dressed with roasted chilli paste, lime leaf, mint, lemongrass, ground roasted rice, and onion. Battered squid mixed with onion, garlic, carrot, salt and pepper. Fried fish fillet topped with ginger gravy sauce and steamed vegetables. Battered Prawns served with sweet chilli sauce. Deep fried fish fillet topped with steamed vegetables and special fresh sweet chilli sauce. Thai red curry cooked with roasted duck, lychee, pineapple, cherry tomato, and vegetables. stir fried and rolled with pastry. Stir fried mix vegetables with soya sauce and oyster sauce. Steamed mix vegetables with soya sauce or oyster sauce. Deep fried Tofu with steamed vegies topped with satay sauce and sweet chilli sauce. Battered mix vegetables served with sweet chilli sauce. Deep fried tofu cooked with onion, garlic, carrot, salt and pepper. With your choice of: Vegetables, tofu, chicken, pork, beef, prawn or seafood. Stir fried meat and vegetables with oyster sauce. Stir fried meat and vegetables with pepper- garlic sauce. Stir fried meat and vegetables with basil and oyster sauce. Stir fried meat and vegetables with basil and spicy chilli jam sauce. Stir fried meat and vegetables with chilli jam sauce and topped with cashew nut. Stir fried meat and vegetables with black bean sauce. Stir fried meat and vegetables with lime juice, and sweet and sour sauce. Stir fried meat and vegetables with roasted chilli paste, lime leaf, lemongrass, and mix vegetables. 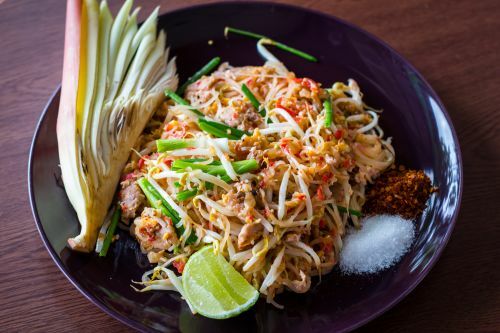 A popular Thai street food made with thin rice noodle, egg, meat, shallots, bean sprout and stir fried with special Pad Thai sauce. Stir fried flat rice noodle cooked with egg, meat, vegetables, oyster sauce and special noodle sauce. Stir fried egg hokkien noodle cooked with egg, meat, vegetables, and special chef’s noodle sauce. Stir fried egg hokkien noodle cooked with egg, meat, vegetables, and special Talee’s spicy sauce. Stir fried flat rice noodle cooked with egg, meat, vegetables, basil, and chilli jam sauce. Original Thai style fried rice cooked with egg, meat, peas, corns, carrot , and onion. Special spicy fried rice in unique Talee Thai style, cooked with egg, meat, vegetables, and special spicy sauce. Special Thai fried rice extra flavoured with basil leaves, garlic, onion and beans. Special fried rice cooked with egg, mix vegetables,mushrooms, meat, flavoured and tasted with lemongrass, Thai chilli paste. corn, carrot, shallot, raisin and flavoured with curry powder. Spicy curry noodle soup, made with hokkien noodle, meat, vegetables, bean sprout, tofu, and special laksa curry paste. Most popular Thai hot and sour soup, cooked with lemon grass, lime leaf, mushroom, fresh chilli and chicken. Mild Spicy and sour soup with coconut milk, cooked with chicken, mushroom, lemongrass, lime leaf and galangal.